It’s my perception that music, and art in general, is, in its purest form, an expression and communication from deep within one person, from as close to their “soul” as the artist can reach in and access, to directly into the deepest place inside another person that the artist can reach. And, with most musical/creative artists, I have some sort of feeling as to what it was that they were or are trying to express to me with their music and art. 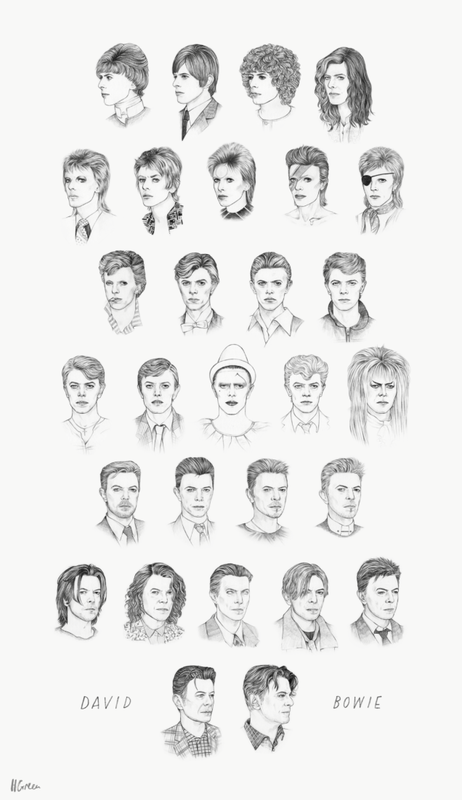 Not so Bowie. His vision and expression, and the place that he was coming from, always felt too deep and vast to me, a little like trying to understand why humans exist on Earth, or why the universe exists. I really can’t think of a rock artist who made “rock” that I feel is more masterful high art than he did. But “art” feels too stuffy a work: as we all know, he emanated art that rocked, and grooved, and seduced, and crunched, and soared, and delighted, and oozed, and charmed, and swung, and pleased, and mourned, and glided, and grinded, and exploded, and humanized, and, yeah, sometimes expanded beyond the solar system to beyond the last point of perception. He was tight-trouser sexier than the rest of the glam rockers. He was more bravely arty and experimental than the rest of the new wavers. And his late model incarnation, the elegant classic gentleman with a quick smile, seemed to emanate confidence, nobility, ease, and kindness in a way that I think only someone who had “gone for it” one hundred percent when younger could authentically express. There was an aloofness to him, but I never got the impression it was based on a sense of superiority. More like he had cracked the code of exactly who he was, and that knowledge gave him an aura of alien remove from the rest of humanity. He acted like he was at the end of the self-discovery road, had been there for decades, but hadn’t forgotten the journey. He stopped and turned to face us as we struggled along the same path and gave cryptic clues and hints on how to progress – through music, fashion, and photos – rather than abandon us to the pitfalls he had lept over. Bowie has been the musical artist whose creations I have felt the deepest engagement with, and what he shared of his journey has captured my interest in the most compelling way. So, even though I get it that there are no objects in this world, only events, I’m still shocked some times when people that simply seem like guiding stars, like point of reference and orientation, turn out to be impermanent mammals as much as the rest of us.